Welcome to the April 2018 Young Oilers team newsletter! We may be small, but we are mighty! Some of the topics include, Essential Rewards Promotions for the month, new products, Facebook groups, Business Building opportunities and goals and new online classes! Our family has been truly blessed by the Young Living Essential Oils and I pray that all of you continue to experience the same blessings. Please take a few moments to absorb all that is below. Come back to it often. With so many products to choose from for your baby, why Seedlings? As a parent or caregiver, you are constantly making decisions. It can be so overwhelming, let alone time consuming! Where do you find time to research the best products for your baby? When we developed the Seedlings line, we took the guesswork out of this overwhelming process. You don’t have to worry about whether the products you’re using on your little ones are pure or sourced from authentic suppliers—Young Living’s Seed to Seal commitment has done that for you. Our years of research and development, along with our standard for unparalleled quality, lets you know that you are choosing products you can trust. These products were formulated with a baby’s delicate skin in mind and use natural, plant-based ingredients. The line is hypoallergenic, and all of the products are vegan friendly, except for the OTC Diaper Rash Cream, which uses beeswax as an emollient to create a hydrating barrier; it is, however, vegetarian friendly. The topical products in the Seedlings line have also been dermatologist tested and pediatrician reviewed. Seedlings is infused with a proprietary blend made especially for little ones—although everyone seems to love it! Young Living’s Calm scent blend has a base of Lavender essential oil and includes Coriander, Geranium, Ylang Ylang, and furocoumarin-free Bergamot—which means there is no UV warning associated with this blend, so it’s safe to use on your baby before taking him or her outdoors. These ingredients are very common in commercial baby products, and many of them are harmful and have been known to have negative effects on our bodies. Being a parent or caretaker is the hardest job! Throughout the course of parenthood, a lot of things happen that are completely out of your control. Something you can control is what you use to care for your baby. It has been said, “There is no way to be a perfect parent, but there are a million ways to be a good one.” Choosing to care for your little ones with products that are formulated to be pure, gentle, and without toxins is a great way to ensure that you’re picking one of the “million ways” to be a good parent! CHECK OUT THE IMAGES BELOW TO SEE ALL OF THE SEEDLINGS PRODUCTS, AND THE NEW LOWER PRICES! GREAT GIFTS FOR MAMAS! ** All members will be able to purchase each of the 4 kits per month ( one each per account). - when worked into the pores - aggravates the pores and causes irritation and breakouts. So you ditched your yucky stuff. The key is to realize how little you need to use. Then it lasts forever, is so cost effective, and is much better for our washing machines. We are ruining our washing machines by using too much detergent which is a very expensive fix. That's also why they start smelling gross. Especially HE machines need tiny amount of detergent in each load. "After trying many, many different types of bio-based or plant-based detergents, I was so thrilled when this new detergent I got my hands on last year came onto the market. I had high hopes that since it was made by Young Living (where I get my essential oils and just about every other personal or home care product I use), it would be really good. And wow. It did NOT disappoint. This little compact bottle does 64 loads of laundry, instead of your typical 32. It’s 6x concentrated, so a little goes a long way. I love that it’s not so cumbersome like those giant jugs of detergent, and doesn’t take up a ton of space in your laundry room. And IT. WORKS. Stains come out, whites don’t get dingy, dirty little toddler clothes actually come out CLEAN. I can’t believe how well it works with only needing to use such a small amount. Like, it is bizarre. Let me walk you through all the ingredients, which they clearly label on the bottle, by the way—I didn’t have to google a safety data sheet just to find it out. I’ve also included each of these ingredients’ ratings on the EWG Skin Deep site—this is a database where thousands of products and also individual ingredients have been rated for their safety or toxicity. The ratings are on a scale of 1-10, with 1 being the least toxic and 10 being the most toxic. A score of 1-2 is considered the lowest possible hazard and very safe. Every single one of these ingredients found in their database ranks in that very safe category. - Decyl glucoside: A plant-derived nonionic surfactant (cleaning agent) that biodegrades easily. Rated a 1 on EWG. - Sodium oleate: Derived from olive oil, an ingredient that helps control suds/foaminess. Biodegradable and rated a 2 on EWG. - Glycerin: Used to stabilize the natural cleaning enzymes. Rated a 2 on EWG. - Caprylyl glucoside: Another plant-derived surfactant that biodegrades easily. Rated a 1 on EWG. - Lauryl glucoside: Another plant-derived surfactant that biodegrades easily. Rated a 1 on EWG. - Sodium chloride: That would be simple table salt. It affects the viscosity/thickness of the liquid. - Sodium gluconate: A plant-derived anionic surfactant that biodegrades easily. Rated a 1 on EWG. - Carboxymethyl cellulose: A plant-derived thickener and stabilizer. Rated a 1 on EWG. - Alpha-amaylase, Protease, Lipase: These are all natural enzymes, which are very effective at breaking down organic particles that make up the stains and dirtiness on your clothes. Without enzymes, your clothes won’t be getting nearly as clean. These enzymes are 100% naturally-derived and are completely biodegradable. - Citrus Limon† (Jade lemon) peel oil, Citrus aurantium bergamia† (Bergamot) peel oil (Furocoumarin-free), Syzygium aromaticum† (Clove) bud oil, Citrus limon† (Lemon) peel oil, Cinnamomum zeylanicum† (Cinnamon) bark oil, Eucalyptus radiata† oil, Rosmarinus officinalis† (Rosemary) leaf oil: All the beautiful, purer-than-pure Young Living essential oils that were carefully chosen for their cleansing and purifying properties. Also, they smell unbelievably DELICIOUS. - Optical brighteners: These are chemical ingredients that are added to most laundry detergents. They reflect light in a way that makes clothes appear brighter and whiter. It’s basically an optical illusion, that comes at a price. Optical brighteners can survive the waste water treatment plants and make their way into lakes and streams, polluting the water and causing harm to algae and fish, where they can bioaccumulate. Optical brighteners may also cause skin irritation and an allergic response in some people. - Sodium laurel sulphate (SLS): You’ve probably heard of this ingredient before, as so many companies are now claiming their products are free of this potentially carcinogenic ingredient. In my research of ingredients in other supposedly “natural” laundry detergents, I found SLS in MANY of them—actually in ALL of the other plant-based brands I listed above. They claim that it is plant-derived and therefore safe, but the laws are so loose on what can be considered bio-based, that I don’t know if this is trustworthy or not. If you try to avoid SLS in your home, I’d highly recommend Thieves instead. - Artificial fragrance: Duh. Of course the only fragrance in Thieves Laundry Soap is Thieves and other pure essential oils from Young Living. Synthetic fragrances can contain hundreds of chemicals with unknown toxicity and potential carcinogens. - Water softeners: I noticed that the Thieves Laundry Soap doesn’t contain any mineral-based water softeners. So, if you have moderately-to-significantly hard water, you probably want to add a simple water softener like Borax (I recommend vinegar instead) to prevent mineral buildup. It’s cheap, effective, and totally natural. Let's hear it! Who loves their Thieves Laundry Soap??? 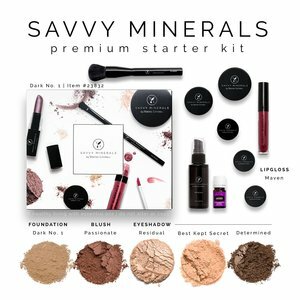 Get to know this months promo products! 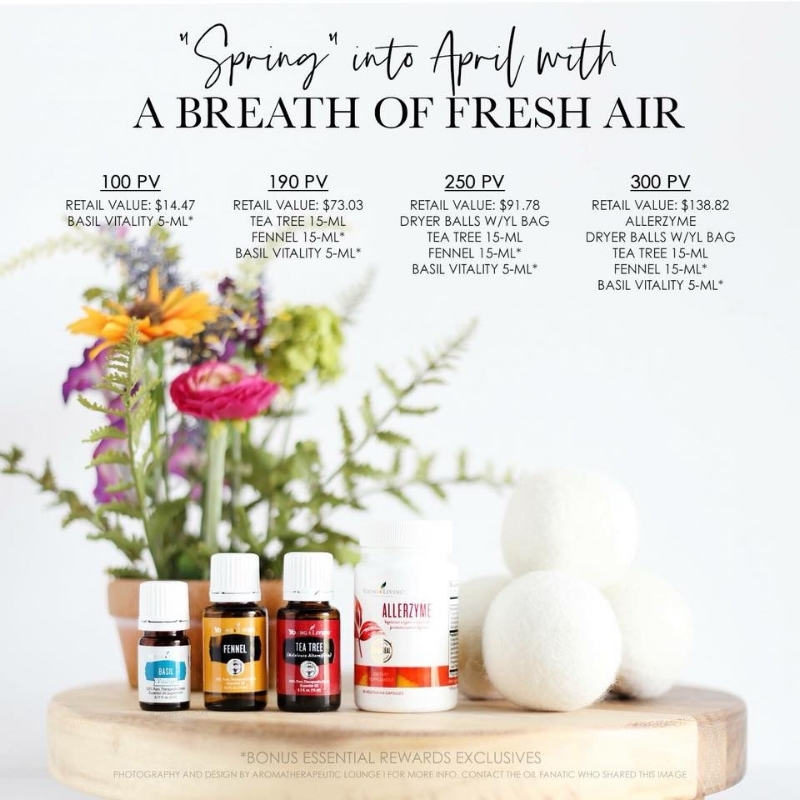 Freshen your day and your laundry with the Young Living Dryer Balls. Add one to three drops of your favorite essential oil (like Lemongrass) to one of the dryer balls. Put all of them in the dryer to freshen up the laundry and speed up dry time. Allerzyme is a vegetarian enzyme complex that promotes digestion. We’re ready for a clean slate! Our Satin Facial Scrub™, Mint has a new, 100 percent naturally derived formula that’s designed to gently polish skin to reveal a glowing, radiant look. 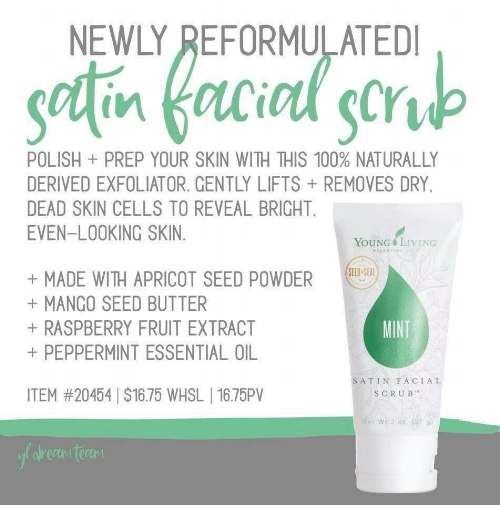 This reformulated scrub now features exfoliating apricot seed POWDER, raspberry fruit extract and mango seed butter, and the fresh scent and invigorating feel of Peppermint essential oil. Why was Satin Facial Scrub, Mint reformulated? Young Living is always looking for ways to improve our products. We saw an opportunity to make this product 100 percent naturally derived, and the new formula better fits our vision and the needs of our members. What are the differences between the two formulas? We have removed soy proteins, wheat and synthetic vitamin A (retinyl palmitate) from the formula and have also added raspberry fruit extract (to act as an antioxidant), and apricot seed (as a natural exfoliant). These additions have also changed the texture and consistency of the product for a more gentle and moisturizing experience. The tocopherol and tocopheryl acetate remain and are derived from non-GMO soy, but don't contain the soy proteins. What are reasons to use the new formula (suggested product claims)? Is appropriate for oily to dry skin. Individual Goal: up to you! Set your eyes on the prize!